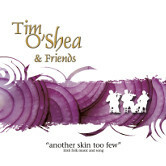 2017 "another skin too few"
Tim O'Shea and friends launch their brand new CD. "another skin too few". A concept CD, they are happy, proud and humble to have arrived at this time and place to mark a musical milestone, "25 years on the road". The selection of tunes on this album may be a bit unusual for some, as there are no reels. The musicians remembered are, Paddy Cronin,(Killarney & Boston),John Cronin(Aghadoe & New York),Stephen Carroll(Kilcummin), Con Durham(Dublin & Dingle). 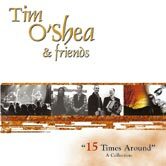 Tim's "friends" on this CD feature Kerry Musicians: Rosie Healy - Headford, (Flute, Whistle & Harmony Vocal) and Michael D.Kelliher - Fossa (Accordian, Melodeon & Harmonica).Tim is Producer and provides a musical thread on (Guitar - Lead & rhythm, Vocal - Lead & spoken & Bodhran). “ 15 Times Around”, featuring tracks from the last 15 years. There are five new studio and live tracks on this CD. This will be on sale at all live gigs this autumn,(2006). Steve Wickham of the Waterboys features on two tracks. There are fourteen musicians on this collection. This CD features 4 reed instruments - uilleann pipes, accordion, concertina and clarinet. This instrument combination brings unique tone and colour to this CD. There are 4 songs and 8 sets of tunes. 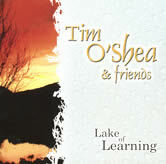 There are two of Tim's own compositions, one tune and one song "The Lake of Learning", inspired by the myths and legends of the Lower Lake of Killarney where Tim lives. With a couple of Sliabh Luachra slides and polkas (dance music of Ireland's south west), slow airs, reels and songs this CD is sure to offer something for everyone. To get a copy of "Lake of Learning" send ?20 International Money Order or Bank Draft to:Tim O'Shea, Lackeen Record, C/O Variety Sounds, College Street, Killarney, Co. Kerry Ireland. Recorded at a Live performance 23rd of Febuary 2001. In front of a home Live audience, the lads play a selection of music from Co. Kerry in the south west of Ireland. The full energy of this dance music is captured on this, their first live CD. To get a copy of "Killarney Boys of Pleasure" send ?12 International Money Order or Bank Draft to:Tim O'Shea, Lackeen Record, C/O Variety Sounds, College Street, Killarney, Co. Kerry Ireland. "FAIR DAWNING - Tim O'Shea & Friends" Presenting a unique mix of traditional music & song from Co. Kerry. This music is a blend of Clare and Kerry styles. Tim O'Shea hails from Killarney. He guested on the 1995 album by Monks of the Screw, a group from the Sliabh Luachra area of East Kerry/North Cork. He plays regularly in Kerry and beyond. Here Tim lends his own interpretation to four songs and accompanies on guitar. Tim has travelled extensively with various combos and continues to tour the USA and most of Europe. The combination of two fiddles, concertina, vocal, guitar and bodhr‡n offers the most seasoned "trad-fan" and the casual listener a rare blend not often found on recordings these days. Enjoy !! 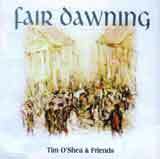 To get a copy of "Fair Dawning" send ?15 International Money Order or Bank Draft to: Tim O'Shea, Lackeen Record, C/O Variety Sounds, College Street, Killarney, Co. Kerry Ireland. 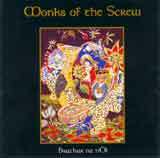 There is no doubt in my mind that Monks of the Screw are the best group around at the moment because of their profound but lightly carried knowledge of material, their musicianship, and the cofidence that come from rootedness. Patrick Kavavagh said that nothing can be universal that is not securely founded init's own parish. This music has been refined through the interpretation of several generations of musical geniuses, (Padraig O'Keeffe is one of the best known of many), is eloquent proof ".